Tonite it's one last sample with the 2 newly released Whippersnapper Sets, Fish Friends & Friendly Expressions. 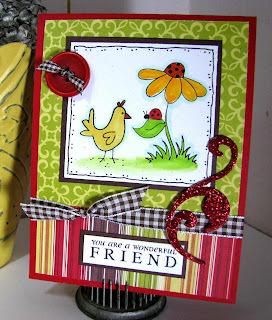 I went really simple with this layout so that the focus is on the sweet little chicken & the ladybug! I also pulled out my red Martha Stewart glitter and my favorite chipboard swirls (Archivers Making Memories hotspot) & added a glitter flourish to the card to make it sparkle! I added a little chicken-scratchy doodle to the edge of the main image with a copic multiliner, and a big red button! Copics: Buttercup yellow (for the chicken), Golden Yellow (flower petals) Celedon green, sanguine, wax white, lipstick red & cool shadow. I love your cards so much and although I don't alway get a chance to tell you I wanted you to know you are an inspiration to me! I left an award for you on my blog! This is adorable! 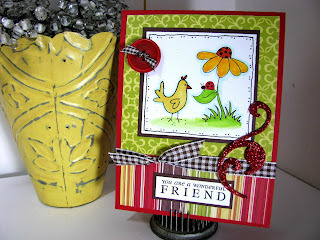 Love the little chicken looking at the ladybug! CUTE CUTE CUTE! I can't decide if I like the chicken or the little ladybug best??!! FAB card Lisa! 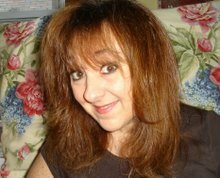 I love the Whipper Snapper cards you've been doing! They're all so cute. Awesome! You use papers that I would bypass, but they are awesome when you use them. I'm going to have to shop differently I guess. Love this card!